WALLEYE Lake Nipissing is a very popular ice fishing destination in Northern Ontario. 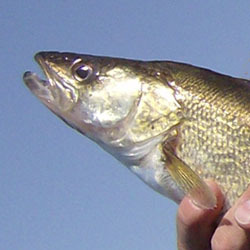 The most sought after fishing during the winter on Lake Nipissing is the walleye, also locally known as pickerel. The dark waters of Lake Nipissing make this lake prime walleye habitat. Annually hundreds of anglers visit Lake Nipissing to try their luck at landing a trophy walleye through the ice and many are rewarded, with fish in excess of 10 lbs landed annually, although the average Lake Nipissing walleye is 1-3 lbs. The presentation of choice is simply a lively minnow suspended under a single split shot, rigged on a ultralight rod. It is critical to watch your line as walleye are notorious for light bites. Buckshot spoons and swedish pimples are also very productive, with plain silver, gold and firetiger patterns producing the most fish. NORTHERN PIKE Lake Nipissing also offers excellent ice fishing for pike. Pike in excess of 14 lbs are not uncommon in the lake. The pike's main food forage is perch, and will inhabit the same areas where the perch are schooling. Pike are often caught while perch fishing, and can be a nice surprise. 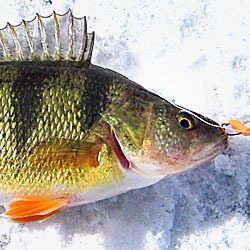 Ice fishing anglers targeting pike on Lake Nipissing, generally fish shallow under 20ft, and use large shinners, chubs or sucker minnows under a tip-up. Large dead baits such as smelt hooked on a deadstrike rig can also be deadly, especially during early ice. PERCH Lake Nipissing is also a very popular ice fishing destination for Jumbo Perch. The sweet tasting flesh of Nipissing Perch is hard to beat and anglers from all over visit the lake to try and catch a limit of these fish. Perch generally school and once you get into a few jumbos, others are not far behind. They will also school with it's larger cousin the walleye, so don't be surprised if you land a few bonus walleye while fishing for perch on Lake Nipissing. The bait of choice for perch is small minnows on perch rigs, or dangled under a single split shot, using the same tackle as for walleye. Again, like walleye, perch can be light biters, so watch your line and if you see movement, set the hook. Small spoons and tube jigs can also be productive when targeting Lake Nipissing perch. Another fish that is often caught on Lake Nipissing and can provide excellent sport is Ling or Burbot. These fish also known as freshwater cod can grow in excess of 10 lbs, although the average Ling is 2-5 lbs. They are often caught at night, with live minnows on or near the bottom. Ling can be excellent table fare and have been known as poor mans lobster. Lake Nipissing is very busy during the winter months and if you are planning to book a trip with one of the many outfitters on the lake, book early as spaces fill up fast. Especially during the weekends and early ice. The nearby town of North Bay also offers many attractions and supplies for your fishing adventure. 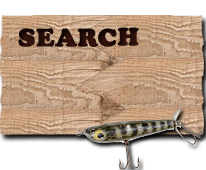 Each detailed map provides depth, contours, structure, boat ramps, and updated fishing information. Ice Fishing Lake Nipissing fishing maps also include lake info such as gamefish abundance, forage base, water clarity, weedline depth, bottom composition, complete latitude/longitude grid lines and dozens of GPS waypoints & coordinates.